Reserved-seat trains also run to Keisei Narita; these include hourly City Liner trains during the middle of the day (once in the morning from Ueno), and the Morning Liner/Evening Liner trains that operate in peak direction during the morning and evening, respectively. All of these reserved-seat trains require an extra surcharge of ¥920 and ¥400 respectively. Morning Liner and Evening Liner tickets can only be purchased on the same day of travel. If you are travelling from Tokyo to Narita City via the JR Line, the hourly Airport Narita commuter train will take you from Tokyo Station to JR Narita station via the Sobu Line in 75 minutes at a cost of ¥1110. An alternate route is to take the Joban Line rapid service from Ueno via Abiko. Either trip is free with a Japan Rail Pass. If you are travelling from Narita Airport to Narita City, the Retrobus tourist bus service makes seven daily runs to central locations and attractions within the city for ¥200; see "Get Around" below. By train, the Keisei Line has more frequent departures (3 trains per hour) than the JR Line (1 train per hour). The Keisei fare is ¥320 and the travel time is 10 minutes. Few Narita Express trains stop at Narita station. Four trains going to Tokyo stop at Narita station in the morning, and four trains coming from Tokyo stop at Narita in the evening. There are three train lines from Narita and all will get you into Tokyo. Note that if coming to the airport, each terminal has its own station and it is imperative that you get off at the right one. The stop for Terminal 1 is Narita Airport (成田空港), and the stop for Terminal 2 is, appropriately, Airport Terminal 2 (空港第２ビル), pronounced kūkō dai-ni biru, or literally, "Airport Number 2 Building". Lists of airlines and their terminals are posted inside the trains. As of July 2010, smoking is not permitted on any of these services. The two premier train services that operate out of Narita Airport are the Skyliner and the Narita Express. 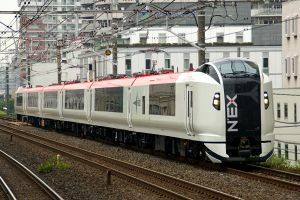 As a general rule of thumb, Skyliner trains offer the fastest ride into Tokyo, while Narita Express trains offer direct one-seat connections to the bullet trains and most of Tokyo's major train stations. If you are on a budget and plan to use any of the various commuter train services that run out of Narita Airport, using a stored fare card (Suica or PASMO) will prove to be convenient. From Narita Airport, the fastest and most expensive way (by rail) into Tokyo is the Japan Railways (JR) Narita Express (N'EX)  into central Tokyo Station. 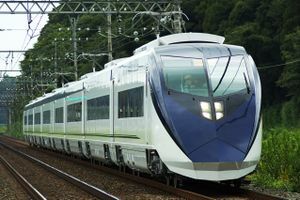 The ride takes 55 minutes, costs ¥2,940 and offers the best connections to Shinkansen (bullet train) services or the JR Yamanote loop line. Trains usually depart Terminal 1 at around 15 and 45 minutes past the hour; there is one hourly departure between 12 Noon and 1 PM, and after 8 PM. Smoking is not permitted on board the Narita Express, and all seats are reserved. Brand new E259-series trains, which offer a smoother and more secure ride, have been introduced on the service from October 2009; they will be fully implemented on all runs by June 2010. Alternatively, you can continue onward in the same train, which splits in two with the front half heading south to Shinagawa, Musashi-Kosugi, Yokohama and Ofuna, while the rear cars go west to Shibuya, Shinjuku and Ikebukuro. Trains run to Hachioji, Takao and Omiya in the evening, with service from these stations to Narita Airport during morning hours. Reservations are required but can be purchased just before boarding if there is space (and there usually is). If there is no space, JR will sell standing tickets for ¥500 less. JR also operates Rapid trains on the Sobu/Narita line, leaving once per hour and stopping at various points along the way, including Chiba. To Tokyo the trip is approximately 82 minutes and costs ¥1,280. These are normal, non-smoking commuter trains and often get crowded during rush hour (though boarding at Narita Airport should not be a problem). If you have a voucher for a JR pass, then you should exchange it here at the JR View Plaza Travel Service Center (Regular JR ticket counter when the View Plaza is closed), as the Narita Express is free with a Japan Rail Pass. You can also make onward reservations from Tokyo. The private Keisei (京成, stylized as K'SEI) Railway offers trains to central and southern Tokyo, as well as direct commuter trains to Haneda airport. Keisei trains run on two routes: the faster, more-direct Narita Sky Access Line and the slower, less-direct Keisei Main Line. Both routes connect to Tokyo's Keisei Ueno and Nippori stations. Nippori offers the easiest connection to the JR Yamanote and Joban Lines, and to the Nippori-Toneri Liner for Tokyo's Adachi Ward. At Keisei Ueno you can walk over to JR Ueno station to connect to the JR Tohoku and Takasaki lines and northbound Shinkansen trains, as well as the Ginza and Hanzomon subway lines. Because the Sky Access and Keisei Main Lines operate on different fare structures, separate ticket gates and platforms are used at Narita Airport's two train stations. Sky Access Line passengers only have to pass through one ticket gate, while Keisei Main Line passengers must pass through two ticket gates. The fastest way to reach Tokyo is by using the Skyliner. This train reaches Nippori and Ueno stations in under 45 minutes at a cost of ¥2400. Seat reservations are mandatory. The cheapest way to reach Nippori or Ueno from Narita Airport is to take a regular commuter train. In the morning and early afternoon you should use Keisei Main Line commuter trains which leave Narita Airport three times per hour and cost ¥1000. During the later hours, the best way to get to Nippori and Ueno is to use a Sky Access Line commuter service which operates directly to these stations (¥1200). The Sky Access Line commuter trains run directly into the subway line during the morning and afternoon hours, making it the best way to get to the Asakusa and Nihonbashi areas. Ginza can be reached by changing trains at Nihonbashi. The Sky Access Line is also the best way to reach Haneda Airport by train. Direct commuter services run to Haneda Airport in 1 hour 45 minutes at a cost of ¥1740 (compared to 1 hour 30 minutes and ¥3000 on the Limousine Bus). Keisei's premier service is the Skyliner , which operates on the Sky Access Line twice per hour. The Skyliner is the fastest train connecting Narita Airport to Tokyo, with trains running into and out of Keisei Ueno and Nippori stations. The brand new Skyliner trains offer comfortable seating and a maximum speed of 160 km/h (100 mph). The full run from Terminal 1 to Ueno takes 44 minutes, with the train traveling nonstop between Nippori and Terminal 2 in 36 minutes. All seats are reserved and the fare is ¥2400 each way. The budget option along the Sky Access Line is the commuter train service known as Access Express, or Access Tokkyu (アクセス特急). Access Tokkyu trains depart every 40 minutes, and most of them run into the Toei Asakusa Subway Line. Making limited stops, the Access Tokkyu is the best way to reach Asakusa (65 minutes, ¥1240) and Nihombashi (70 minutes, ¥1280). Shimbashi (75 minutes, ¥1280) puts you within easy reach of the Yurikamome to Odaiba. A change of trains at Nihombashi will allow you to make a quick hop into the Ginza district (Higashi-Ginza Station, 80 minutes, ¥1280). Many services also continue onto the Keikyu Line for Shinagawa (85 minutes, ¥1460) and Haneda Airport (105 minutes, ¥1740); if your train terminates at Nishi-Magome then you can change trains at Sengakuji station. After 4:00 PM (5:00 PM on weekends), Access Tokkyu trains run directly into Nippori and Keisei Ueno in 60 minutes at a cost of ¥1200, otherwise you will have to change trains at Aoto station; this increases travel time to 70-80 minutes. From the Access Tokkyu trains you can transfer at Imba-Nihon-Idai station - two stations after Terminal 2 - to local Hokuso Railway services. At Shin-Kamagaya station you can change to the Tobu Noda Line and Shin-Keisei Railway, and at Higashi-Matsudo station you can change to the JR Musashino Line. Regular Tokkyu (特急) commuter trains - those that do not carry the "Access" designation - depart from Narita Airport every 20 minutes, reaching Keisei Ueno in 80 minutes at a cost of ¥1000. During the morning and early afternoon hours, you should use these Tokkyu services over Sky Access trains as they offer a one-seat, cheaper ride. After 4:00 PM (5:00 PM on Weekends), Sky Access trains offer a one-seat ride from Narita Airport directly to Nippori and Ueno; the 20 minutes you'll save on the Sky Access train is worth paying the extra ¥200. If you want to pay more for a reserved seat, Keisei operates hourly City Liner trains during the middle of the day only. Using older trains that operated Skyliner services prior to their upgrade in July 2010, City Liners run on the Keisei Main Line and make stops at Keisei Narita, Funabashi, Aoto, Nippori and Ueno stations. The travel time from Ueno to Narita Airport is 75 minutes at a cost ¥1920. There is also a daily 7:00 AM City Liner departure from Keisei Ueno to Narita Airport. The City Liner is good for traveling to/from Aoto, Funabashi and Keisei Narita stations, otherwise to reach Narita Airport you might want to think about paying the extra ¥480 to use the faster Skyliner. Other reserved-seat services include the Morning Liner which operates from the airport to Ueno twice in the morning, and the Evening Liner which operates from Ueno to the airport six times at night after the final Skyliner service has run. Morning and Evening liner trains are cheaper than the City Liner at ¥1400, but the drawback is that you can only make a seat reservation on the day of departure from a special ticket vending machine. From the Keisei Main Line you have the option of transferring at Funabashi station to the JR Chūō-Sobu line or at Katsutadai station to the Tōyō Rapid with through service to the Tōzai subway line, both of which go right through the middle of Tokyo. The Chūō-Sobu line goes through Akihabara (86 minutes from Narita, ¥1100), Ochanomizu, Yotsuya and Shinjuku (104 minutes, ¥1260) and facilitates an easy transfer to the regular JR Chūō express, which goes as far west as Tachikawa, Ōme, Takao and other destinations beyond. The Tōzai line takes a slight southern approach with stops including Kiba (77 minutes, ¥1400), Nihonbashi, Iidabashi and Takadanobaba (98 minutes, ¥1440). Note that none of the subway or Chūō lines are specifically prepared for travelers with big luggage and tend to get crowded once inside the Yamanote ring, the exchanges at Katsutadai and Funabashi are usually rather pleasant though. This page was last edited on 16 July 2010, at 05:02.